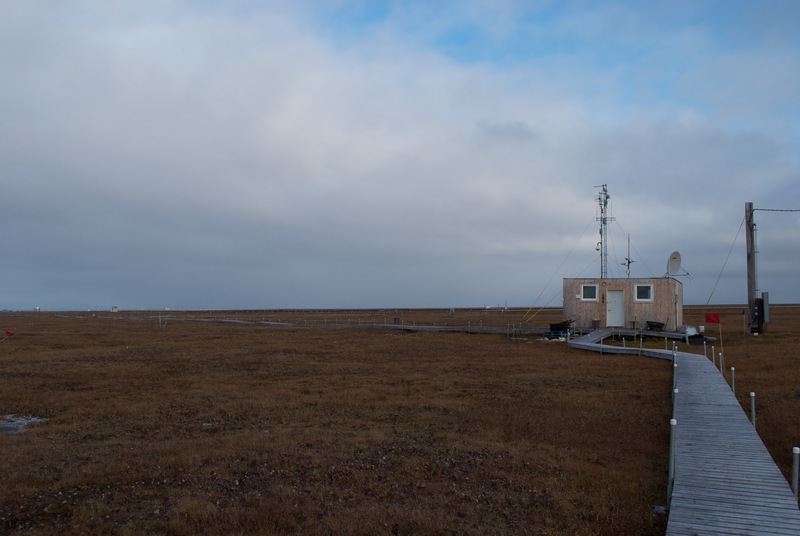 This morning, I headed out to the BEO (Barrow Environmental Observatory) located south of the BARC (Barrow Arctic Science Center) to check out a wireless network problem. In all the years I've been coming to Barrow, I have never made it out to the BEO control shed, located 1.12 miles from the nearest road. 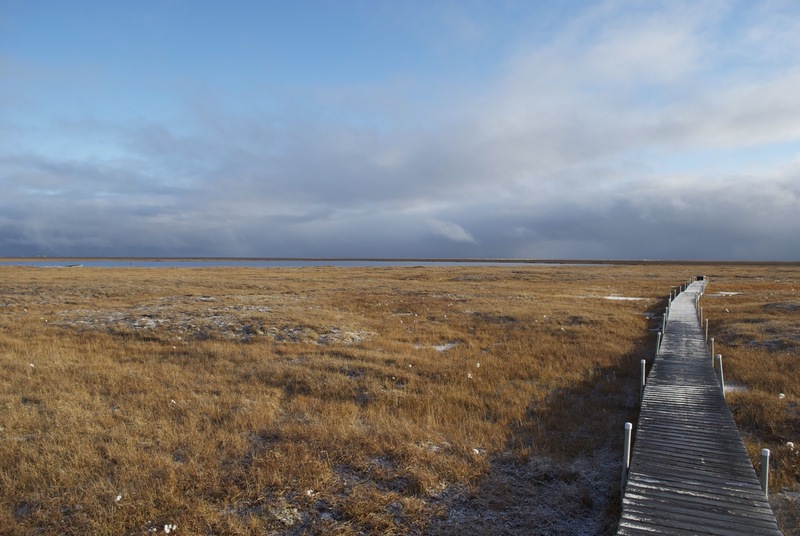 In the past, this link was the responsibility of the BASC (Barrow Arctic Science Consortium) to maintain but since the re-organization of IT responsibilities, it sort of landed on me since the link directly supports research. I've been to the BEO turnout before and seen the boardwalk and just kind of assumed that the walkway went all the way out to the control shed. Someone at BASC mentioned that I might want to borrow a pair of rubber boots since it was a little wet. That was an understatement. Most of the walkway was on these plastic pallets that were very difficult to walk on and in many places the pallets disappeared under the ice. 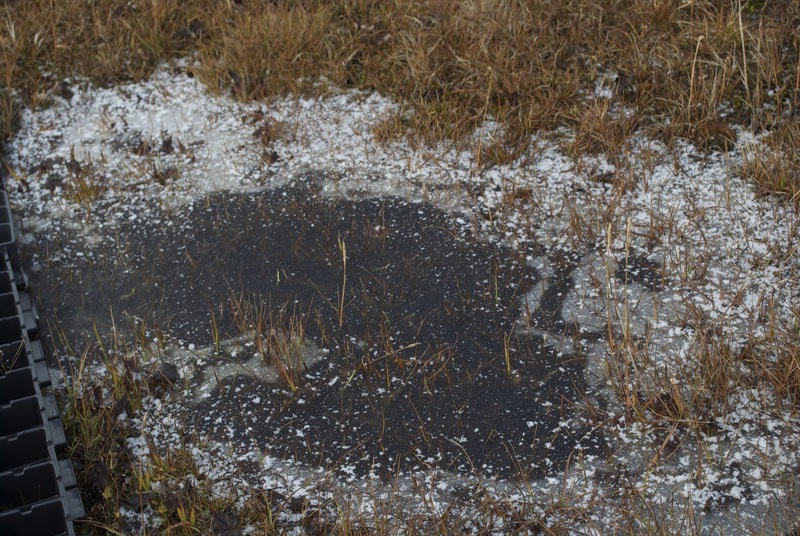 I ended up breaking through the top layer of ice at each of these puddles and some were almost a foot deep. 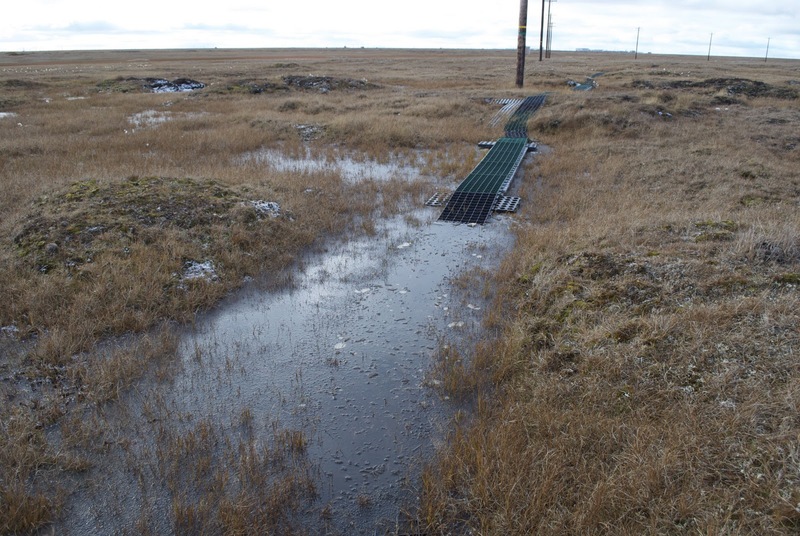 Even though it looks drier to the side, you aren't allowed off of the path since that would disturb the vegetation and maybe screw up someones experiment. The control shed is a heated structure about 8x16 feet containing a pile of equipment. Stuff gets hauled out here and once it is no longer needed, some of it ends up staying out there. There are older generations of radios providing network access to the equipment. The network is used to provide real-time access to the data being collected. It turns out that the radio out here was working just fine, in fact I could see the radio on the roof of the BARC through the network. Loopback tests gave me zero packet loss at 18 Mbps. Can't complain about that being literally in the middle of nowhere. I couldn't resist stopping on the way back to get a shot of the ice and fresh snow. Since the radio was working, I traced out the cables in the BARC and found a disconnected network cable. I don't know who/when/why it was disconnected but the cables and the switch ports are now well labeled. Hopefully, people will read the labels. This was kind of a fun problem since I have never known anything about this particular connection except people complaining about it. That's the reason there are so many different connection methods. There was a WipLL client in the shed so I had good, solid connectivity to the Internet. But most of the experiments were connected to the other radio system. It actually is an interesting walk and if it wasn't so wet and icy, a pretty nice walk as well.